The Nutri Ninja is easy to assemble. You twist the blade onto either the 500ml or 650ml cup. You then flip the cup upside down and lock it into the motor base. You pulse by pressing down on the cup. You then remove the blade from the cup and replace it with a lid. It came with a rubber seal that wasn’t detailed in the instructions and didn’t clearly fit onto the machine anywhere, so we rang the number in the instruction booklet to find out what it’s for. The person who took our call said they didn’t know what it was and said if we were worried about it we should take it back to the store. We tried the Nutri Ninja using a recipe from the booklet that comes in the box. It was called the Coconut Mango Energyade and the ingredients were mango, fresh mint, coconut water and a sweetener. The instructions say to pulse for best results but after 20 seconds of pulsing the mango was chunky. After another 20 seconds of pulsing it was less chunky but not smooth. When we added a banana to the mix it was a lot more pleasant and gave it a smoothie texture rather than a lumpy juice. We should mention at this point how noisy the machine is. Our colleagues at the other end of the office came to see what the racket was. We made another drink using the same ingredients with the addition of kale to see how the Nutri Ninja would go with a fibrous ingredient. After 40 seconds of pulsing, there were only very fine bits of kale through the juice. We then made another drink using the same recipe but added whole almonds. There were finely chopped almonds through the juice after 20 seconds of pulsing and after 40 seconds we had a gritty juice. Soaking nuts overnight before adding them would help achieve smoother results. 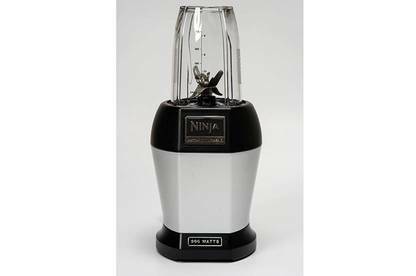 The Nutri Ninja’s instructions say not to use dry ingredients in it without a liquid so you can’t use it to grind nuts. The Nutri Ninja crushed 10 icecubes very quickly – within 15 seconds of pulsing. However, it was hard to remove the blade as it was surrounded by tightly packed crushed ice. We had to yank on the blade part to remove it, which could be dangerous. Ice went flying over the bench and floor when the blade eventually came out. We did have some problems removing the lid seal cover as it latches onto the lid very tightly. You also wouldn’t want to put full cups in your handbag as liquid is able to leak out from where the lid screws into the cup. The lids and cups can be put in the dishwasher but the instructions say the blade should be wiped clean with a damp cloth rather than immersed in water. We thought this seemed dangerous so very gently rinsed it under a running tap. The Nutri Ninja is easy to set up and quickly blitzes ingredients into a juice or smoothie. It did well with kale but had a gritty feel when we added nuts. We wouldn't have described any of the juices we made as "silky smooth" like the box advertises. A lot of the appeal is being able to drink what you make in the Nutri Ninja on the go – just make sure you hold the cup upright or you’ll have a mess on your hands.